Meet Eric Sills, a JSU Graphic Design senior who was a winner of the Center for University-Based Development’s (CUBD) art competition. He submitted his design to CUBD a few weeks ago and his design was approved by the City of Jackson and The Greater Jackson Arts Council. 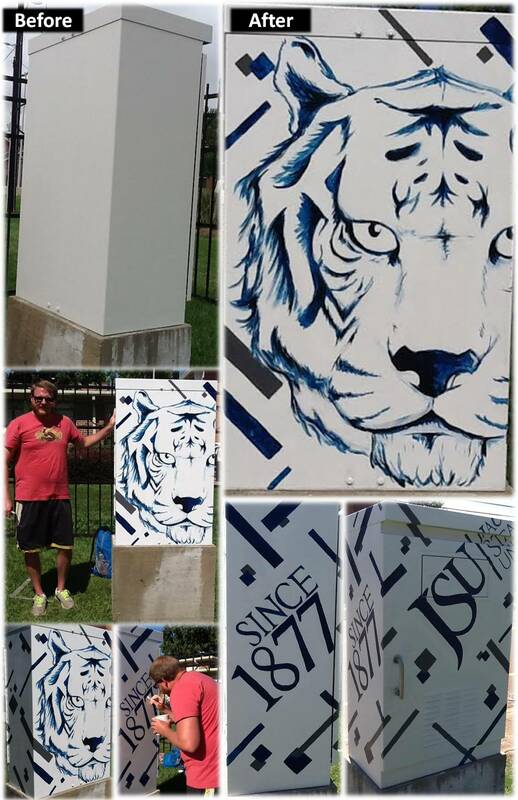 Over the past two days Eric has been hard at work painting the traffic signal box located at the traffic light on Dalton St. It took him a total of nine hours to complete his work and it looks amazing. There are still several traffic signal boxes that need to be painted around JSU and CUBD is still accepting applications. CUBD will pay selected artists $500 dollars for their work. Below is a link to the entire application. Please review carefully, because there are strict guidelines. Each submission has to be approved by the City of Jackson and The Greater Jackson Arts Council.